Thanks very much to everyone who entered last month's competition to win a world dive map. The winners were: Jaime Moreno, Mitchell Coughran, Eero Vaananen, Nariman Khajeh Kazroni, Bruce Copas and Rick Mahan. Congratulations to all of them. Commiserations if you didn't win - but more maps are available from Awesome Maps. We've a guest article this week on family-friendly diving on Dominica. I can certainly second that. We took our four year old there some years ago and had no trouble finding baby sitters, taking her on the boat and so on. A safe and friendly environment for children. Is anywhere better than the Galapagos? The meeting of three ocean currents bring warm water corals, antarctic fur seals plus more sharks than anywhere else on the planet. The Maldives - Which Atoll to Choose? The protected Baa atoll - home to five species of turtle, the mantas of Baros island in North Male atoll or perhaps the wilder deep south atolls? The longest fringing barrier reef in Australia, and the only example in the world of extensive fringing coral reef on the west coast of a continent, Ningaloo Reef is famous for whale shark, humpback whale and manta migrations. 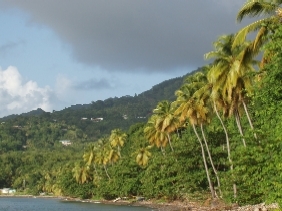 Dominica is a Caribbean island unlike the rest. It is considered the nature island and I feel it certainly deserves the title. Lush green mountains that pour down into the sea. I spent two weeks there, hosting 15 families with kids ranging in age from 6 to 18. It's a little tricky to get to, you will have to travel via another island. It takes a good full day to get there, but in my opinion well worth it. Dominica has so much to offer a family, from waterfall hikes, fresh water lakes to fish, kayaking the indian river, Sperm whale watching, and of course scuba diving activities. I chose Fort Young, as it's right on the water, has connecting rooms and suites for families of 4 or 5. Buddy Dive Dominica is a new dive center located at Fort Young, just a little over a year now. They have 3 boats so private groups and trips for family is easy. Their dive staff is very kid and family friendly. Garth a new instructor there is also excellent with special needs kids and adults. We had a dad who recently lost his leg in a bad accident and wanted to learn how to dive again with his new aqua leg. Needless to say, at the end of the week, he was looking like every other diver. He was even lion fish hunting each day. Franchesca was fantastic with the kids. Buddy Dive has a waiver from PADI to take Seal Team kids age 8 and 9 diving up to 12 ft in the ocean. There is a special training area to do just that. Jr. Open Water diver courses were run smoothly and we had 6 students that completed their course. Open water instructors dive with the kids all week, even after they complete their courses. I have to say the best dive of the week for the photographers was the cruise ship pier located just to the right of the Fort Young Hotel. This was fantastic! Abundant corals, seahorses, sponges, bat fish, crabs and shrimps. The kids and adults also enjoyed this as part of their unlimited shore diving package. The diving in Dominica is volcanic formations mostly and pristine reefs. I felt this was some of the best diving I had seen in the Caribbean in years. We encountered wild dolphins daily along with turtles from the boat. There is a local pod of Sperm whales about 7 of them that stay year round. Amos Nochoum runs special trips each year where you can snorkel or dive with them. (biganimals.com) Buddy Dive is a very kid friendly dive operation, they have small gear sizes and small tanks and experienced kid friendly instructors. I would highly recommend this resort and dive operation for families. There are 3 restaurants at Fort young with a variety of great foods for all. Overall, I just wanted to report how pleasantly surprised I was to find how much Dominica has to offer every member of your family, from the littlest seal to grandma and grandpa. Easy calm diving and lots of fun. Read more about the diving on Dominica on the SCUBA Travel web site. 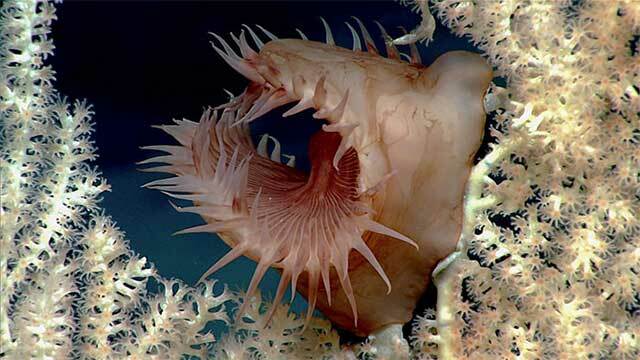 The team aboard NOAA Ship Okeanos Explorer have completed the Mountains in the Deep expedition. 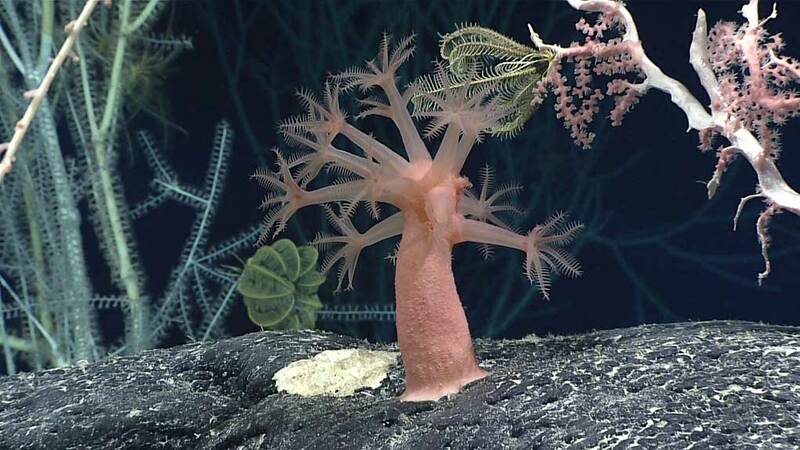 Several different vibrantly colored animals can bee seen in this image, taken at 2240 meters, including an Anthomastus mushroom coral, precious pink coral, bamboo coral, and feather stars (Crinoids). 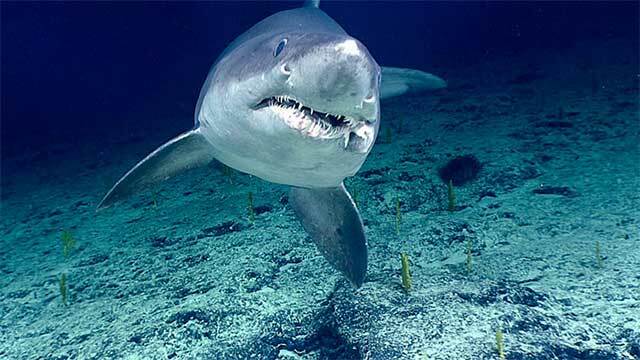 Smalltooth sand tiger shark at 1025 meters . 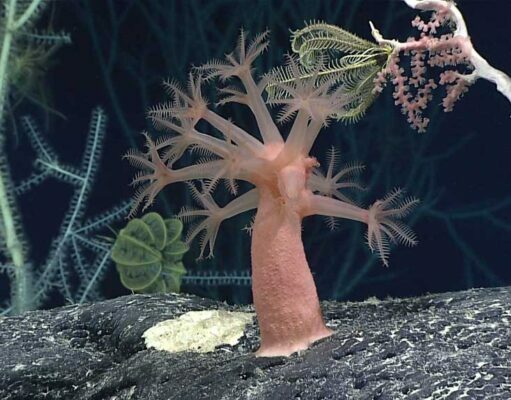 The Okeanos Explorer plans to explore the Johnston Atoll Unit of the Pacific Remote Islands Marine National Monument and the Musician Seamounts, located northwest of Hawaii, later this summer. Live video feeds will be available to anyone online, providing you with a front row seat to discoveries as they are made. 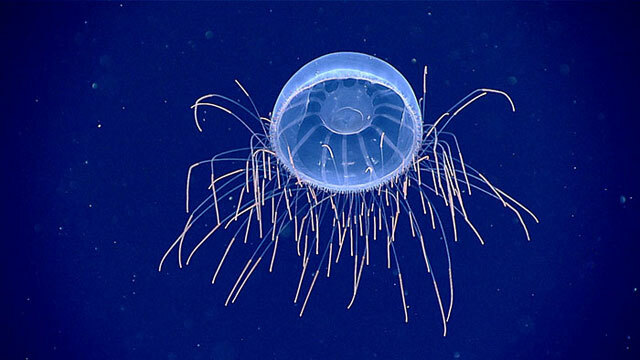 Hydromedusa at about 1200 meters. 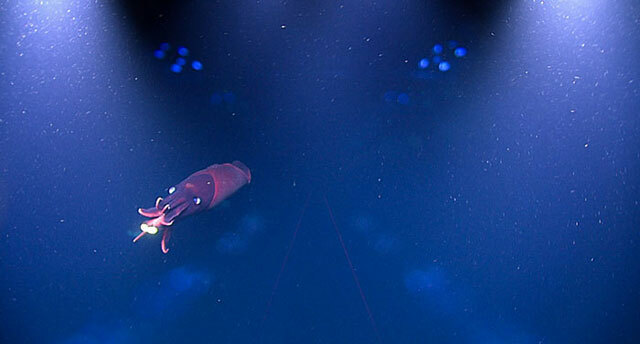 The ends of its tentacles are packed with nematocysts (stinging cells), which make them appear especially bright. Book now to dive the Galapagos on the intimate MY Nortada. This luxurious liveaboard accepts a maximum of just 8 guests. 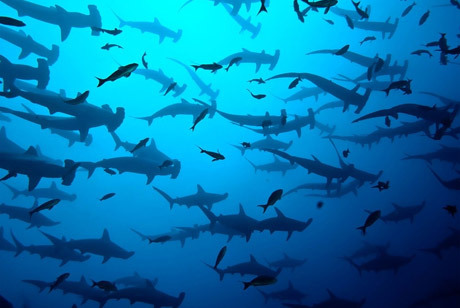 See whale sharks, mantas, schooling hammerheads and massive shoals of fish at Wolf and Darwin islands. Anyone who has either a Suunto wireless tank pressure transmitter or tank POD should take their products to an authorised Suunto dive dealer service centre for inspection, upgrade and guarantee extension. ...to help better understand how changes in the ocean are affecting weather, climate, fisheries and marine mammals. The wind and solar-powered research vehicles will travel thousands of miles across the ocean, reaching some areas never before surveyed with such specialised technology. Following two years of intense pressure by environmentalists, labour unions and human rights organisations, Thai Union, the world's largest tuna company, has announced a breakthrough package of reforms. Underwater glider drones can travel far on little power, but they're slow. The US navy wants to give them a speed boost by letting them take flight. Oil companies planning to drill have calculated that the ecosystem has a 30% chance of being affected in the event of a spill. Invasive ascidians -- sac-like marine invertebrate filter feeders -- are nuisance organisms that present a global threat. They contribute to biodiversity loss, ecosystem degradation and impairment of ecosystem services around the world.A new study finds that ships play a dominant role in introducing and dispersing these tough-shelled non-indigenous organisms into new environments. Study emphasises the risks of increasing industrial activity in areas like the Great Barrier Reef.